Dramaturgy for a conference – Plataforma Fluorescente & International Dramaturgy Festival invites three local artists Mariana Obsersztern, Juan Onofri Barbato and Tomás Espina to hold a performative conference at the 12th edition of the Festival Internacional de Buenos Aires, FIBA, following an instruction manual which was crafted by the Franco-spanish philosopher Paul B. Preciado. 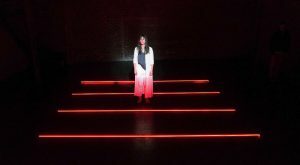 The project, curated and created by Matías Umpierrez, was presented for the first time at the 2018 edition of the International Dramaturgy Festival and questions the possibility of creating a manual whose instructions could draw up a sort of dramaturgy, with several steps to follow in order to approach any subject. Is there a narrative prior to the construction of any discourse? Guided by the different steps proposed by Preciado, this time will be Mario Bersztern, Juana Onofri Barbata and Tomassa Espin the identities that the speakers will take to dictate their performative speech at Recoleta Cultural Center. With this Manual, Preciado aims to enhance the cognitive emancipation of the audience/spectator, by intentionally increasing or decreasing the presence of linguistic marks and cultural codes behind gender production. The question veers towards the onlooker and the listener: why repeat the gender which has allegedly been assigned to me?, would it be possible to introduce variables of change?, does the world change if I change gender? More about Juana Onofri Barbata (o Juan Onofri Barbato)’s conference.